I ran some more experiments since my last post to better understand my system. My first lesson, mentioned by you earlier in this thread, do not run the TEC at full power. This TEC is rated for 24V 15A. It works at that combination, but gives essentiall the same cooling power with much less waste heat at 15.5V 11A. My second lesson, I made the assumption that my heat load in my test setup was negligible. Dumb assumption on my part. The exposed surfaces in the tubing and water container is significant. How do you determine the rated temperature for the hot side? My working assumption is that I want to minimize the hot side temperature. Do I need to keep the hot side at a specific delta Temp from the cold side? In my specific example, I am running 10C on the cold side. I can control the hot side temperature by adjusting the radiator performance. This is step 1 in a multiple TEC system. One set of TEC's will be cooling chips to -20C and a second set of TEC's will be cooling the hot side of those TEC's to 10C. The system will need to be optimized and your TEC calculator could prove quite useful in this process. Do you have a version of your TEC calculator that works with Windows 7 Pro? I downloaded and tried to run the program, but it did not work (did not respond to keystrokes). During the installation several of the dll's to be loaded were older than the versions on my computer so I did not allow the older versions to be installed. Above is a performance chart from a manufacturer...now manufacturers charts are not deemed accurate mainly because it is almost impossible to recreate the parameters of the chart in real life. You can ignore the actual values on the axis the important bit is the relative shape of the and the information it shows. If you look near the top right hand corner it says 27˚C =Th this being (T) emperature of (h)otside. To produce this chart the manufacturer used a hotside temp of 27˚C. You will never get same output from your TEC even if it was the correct chart without your hotside being held a 27˚C. You will find this impossible. So if your hotside is hotter or cooler than 27˚C the results will ALWAYS be different. If you cool your hotside below 27˚C you wont achieve what the manufacturer chart says. Next..... to the right you will see Delta T in ˚C above a short inventory. This is the difference in temp between the hot and cold sides. The different coloured lines represent Q in relation to Delta so you can see straight away that you dont want a large delta between your hot and coldsides (and low deltas are notoriously difficult to achieve.) and you can see you also need the TEC to be drawing a reasonable current to achieve reasonable Q. So....what's the point of a manufacturers chart ? You only use a manufacturers chart to asses the suitabilty of one TEC over another that's why they are generally all at the same Th. they know the man on the street is not going to have a lab setup. Then you must test the TEC you have chosen. The heat losses of your setup through hot/coldsides and other bits will determine what performance you actually end up with and it is down to you to test/tweak to get your best performance with your chosen TEC but your cannot reasonably start comparing this back to the manufacturers chart and questioning why you cant get the same performance.....you wont because your Th is not static and you are unlikely to of reduced heat losses to the same degree as a lab. You mention controlling your hotside temp with a radiator...hmmmmm...I fear you aren't at least not in the manner your hoping, I believe you dont have sufficient control to get the static performance your hoping for especially if your processor's in the loop. Unfortunately if you are cooling TEC/s with a radiator then using those TEC/s to cool the hotsides of further TEC/s which then cool your system.......I regrettably predict that that you will never achieve the performance you appear to be hoping for, I have never believed stacking to be of any use. It compounds all your heat losses, your deltas etc not to mention you will have to seriously upgrade your rads, I think you have overlooked the heat output of the top TEC's hotside when you plan to cool the coldside of the bottom set to -20˚C. You are far better to use high performance TECs (greater than 127 couple) of a reasonable high voltage which you then step down conservativelly by WIRING them into series and parallel goups to achieve the correct voltage/amps for each TEC. I believe this is what you have already been told by someone else. Ths is what they meant. Two TECs or groups wired in series leaves current draw the same and halves voltage per TEC/group, Two TECs or groups wired in parallel leaves voltage the same per TEC/group and doubles current draw. If you list the company & cat.no for both sets of TECS you plan to use (please dont say they all the same.) or a copy of the manu. stats I am sure Ultra will advise. Unfortunately people buy TECS then try to mould them to their plan....You need to work everything out first including voltages etc then find the TECs that have a fighting chance of achieving what you want and then test them to see if you were right. Then install them to work. I have had a little look at what you have done in your setup. Did you know that when buying TEC's you can , if you pay more, have premium TEC's nearer to the advertised quality ? This is particularly handy when using multiple TEC's. When manufactured all TEC's vary a bit they are tested and graded and ultimately some fail the grade. If your using multiple TEC's ideally you want them all the same you don't want them with differing resistances (and therefore differing running characteristics.) you can ask for them to be matched for resistance and also ask for them to be within a tolerance of resistance. If your mounting several TEC's between single hot/coldsides you can ask for them to milled so they are all the exactly the same height. This is important because when you tension the TEC's (apply torque on the screws.) compressing the TEC's increases the resistance so if the TEC's arent all the same height they wont increase by the same amount. This is the reason why you should not overtension TEC's....stick to the manufacturers limit. I notice you plan to have the coldside at -20°C (realistically unfeasible.) with the hotsides cooled to 10°C by the top TECs (not sure how feasible this is.) the delta will be 10-(-20) = 30. So, looking at the Qc to Amp chart on the left of the manufacturers charts, with you thoeretical current at 11A and a delta of 30 the working Q will only be 100w not your intended 150w. To further compound the problem your hotside is cooled to below 27°C so you wont even get a working Q of 100w it will be less. 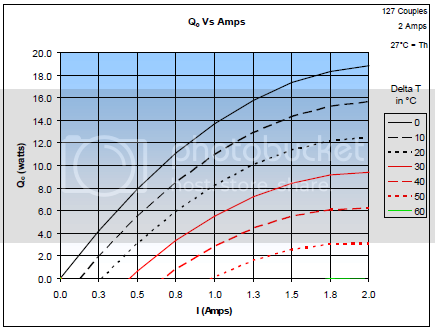 Of course with the actual rated current at 15.5v (according to the graph on the right.) which is nearer 9.5 amps you will get a Qc of nearer 80w which again has to be adjusted down for the cool hotside. In short these TEC's probably wont achieve what you want.